In recent years considerable research has been conducted on children as victims of the “euthanasia” crimes in Nazi Germany. Remarkable results have been achieved in naming perpetrators, tracing back life stories of victims, and unveiling structures and procedures of the patients’ murder. It is clear by now that more than 10.000 children and adolescents – mainly coming from the lower and middle class[i] – were killed actively or passively within the framework of “euthanasia”. 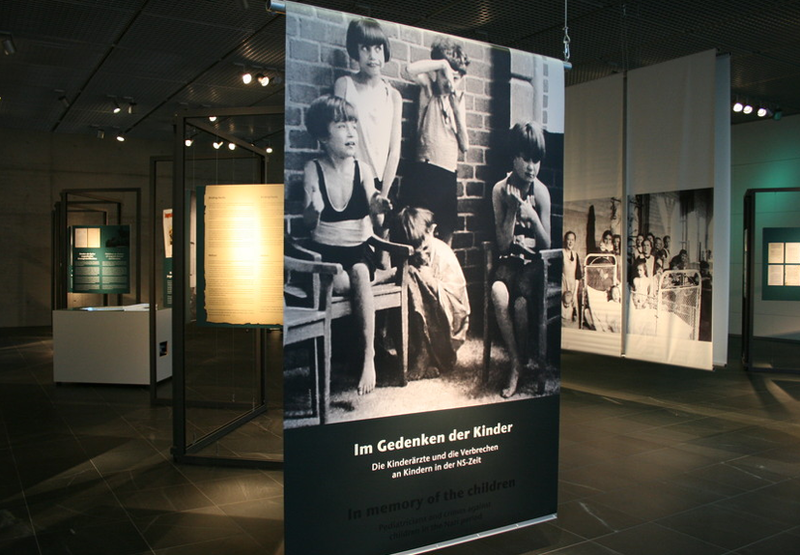 The German Society of Pediatrics and Adolescent Medicine initiated the temporary exhibition “In memory of the children” presently shown at the Topography of Terror Documentation Center to document these crimes according to the current state of historical research, and equally importantly, to commemorate the victims. Entering the exhibition space the visitor instantly becomes aware of a large-sized illustrated panel that divides the venue into two sections. Close-up photographs portray under-age inmates of a mental asylum on the one side and physicians being accused of their crimes after 1945 on the other side. The installation might not have explicitly been planned as an introduction – but it nevertheless serves quite well as such. Looking at the photographs one thought immediately crosses the viewer’s mind: They are foremost about individuals and their scope of action – the responsibility of the perpetrators and the helplessness of those children who were left completely unprotected. This first impression is strongly confirmed by historical facts as soon as one takes one’s eyes off this central scene and delves into the exhibition’s actual contents. Here, the visitor is confronted with the suffering and the death of children, and with the physicians’ massive violation of ethical boundaries in their treatment of the boys and girls entrusted to their care. As detailed biographical information and medical data are presented one gets very close to the children’s individual fates. One case the exhibition documents in exemplary fashion is that of Guenther, who was ten years old when he was gassed within the framework of the centralized “euthanasia” program “T4”. Nazi welfare services considered his family “a-social” and “hereditarily defective”, and the boy was therefore placed in foster care. Against his parents’ explicit will, he was committed to mental asylums in Potsdam and Georden (Brandenburg). In 1940 it was decided at the Berlin “T4 Headquarters” to murder him. Guenther’s case and the motivation for his murder are elucidated in the catalogue by Petra Fuchs[ii]. Referring to essential results of historical research, she points out that the decision to kill the boy was not only taken on grounds of the contemporary diagnosis “imbecility” but mainly due to a negative prognosis regarding his capacity to be educated and to support himself. It was thus predominantly the assumed degree of future social and financial dependence of the child that motivated his killing. The “T4 Action” was only one of several institutional settings where medical crimes against children took place. Besides the killing of physically and mentally handicapped children within this framework of centralized “euthanasia”, hundreds of the under-aged died in pediatric and psychiatric sections of hospitals through the denial of treatment, deliberate starvation, or deadly injections. They were sent to especially established “Children’s Departments” at clinics where they were medically observed and tested, before they were killed primarily through the sedatives Luminal or Bromural. As exemplified by the “Research Facility” at the Heidelberg University Psychiatric Department, those “child subjects” (“Forschungskinder”) were murdered in order to put their corpses at the disposal of brain research projects. [iii] Furthermore, the exhibition focuses on medical experiments on epidemic jaundice and TB in concentration camps, which principally offered “extra-legal space”[iv] for ethically uninhibited medical research on their prisoners. As the authors of the catalogue underline, these tests “should not be seen as pseudo-medical experiments, since most of them corresponded in terms of their purposes and methods to the state of scientific practice at that time”. [v] In this context, the exhibition documents the case of four-year-old Wolfgang who was infected with tuberculosis pathogens in the concentration camp Neuengamme southeast of Hamburg. His large-sized medical chart is presented on a table-like case that enables the visitor to study it in detail, while explanations are given in order to understand the curves with their peaks and valleys. Now the visitor himself turns into an observer of parameters like temperature, medication, food intake and defecation. This interactive module allows us to get in touch with both the “doctors’ gaze” (M. Foucault) and the suffering of the four-year-old boy. It represents an educational highlight of this exhibition. Besides touchscreens on “Hereditary Teaching and Racial Science” and the geographical spread of “Special Pediatric Sections” throughout Nazi Germany, the exhibition tries to communicate its themes primarily through reproduced documents and photographs mounted on horizontal panels. This form of presentation matches the design of the permanent exhibition of the document center. Considering the venue’s topic it is certainly appropriate to abstain from any effect-seeking scenography and choose an unobtrusive design. However, the exhibition’s design would have benefited from more visual elements that would help to identify key aspects or make it easier to follow the various threads of the exhibition. Considering the great number of international visitors to the document center it is a real pity that documents such as patient records are often not translated into English – not even in extracts. Generally, the exhibition aims at mediating the enormous amount of knowledge that has been researched within the last years from a primarily biographical perspective. This approach is combined both with explanation on organizational processes within the context of Nazi health policy and information on the entanglement of contemporary medical science with eugenic thinking and racial ideology. Taking into account the rather small space that is offered to the temporary venue, the task of both documenting the topic in its broad diversity and of communicating all this to the visitor is of course very ambitious. As is to be expected, the exhibition leaves the visitor with lots of questions, which the excellent catalogue, edited by Thomas Beddies, attempts to provide answers for. [vi] It includes five valuable articles (with English translation) written by historians who are known as specialists in the field of “euthanasia” crimes in Nazi Germany. The children’s fates become again manifest in the catalogue, especially since the authors reflect individual stories from the deeply diverse perspectives of parents, doctors and attendants. They thus draw a very coherent picture of the particular cases. It is the most painful and finally lethal experience of 4-year old Wolfgang that sticks in my mind after I have left the exhibition. The victim’s stories are very moving and their suffering stands in harsh contrast to the absence of empathy on the side of the pediatricians who participated in the medical crimes in Nazi Germany. Stephanie Neuner is a historian currently involved into a research project at the Institute for the History of Medicine at the University Wuerzburg, Germany. Before she had worked several years for the Deutsches Hygiene-Museum Dresden, Germany. She studied history and politics at the Ludwig-Maximilians-University Munich and Edinburgh University. One of her main research interests focus on the cultural history of psychiatry. Her recently published book, Politik und Psychiatrie. Die staatliche Versorgung psychisch Kriegsbeschädigter in Deutschland 1920-39 (Vandenhoeck & Ruprecht 2011) deals with compensation policies towards psychologically disabled veterans of WWI in the Weimar Republic and the Nazi State. [i] S. Topp, “The murder of handicapped children and youth in the Reich Committee Procedure (1939-1945)”, in Im Gedenken der Kinder – Die Kinderärzte und die Verbrechen an Kindern in der NS-Zeit/In memory of the children – Pediatricians and crimes against children in the Nazi period, exhibition catalogue, ed. by T. Beddies on behalf of the German Society of Pediatrics and Adolescent Medicine (DGKJ) (Berlin 2012), p. 13-19, here p. 18. [ii] P. Fuchs, ”Action T4” – Children and youth as victims of the Nazi’s centralized “euthanasia” program (1940/41), in ibid., p. 20-26. [iii] See M. Rotzoll, V. Roelcke, G. Hohendorf, “Deadly experiments on children – Carl Schneider’s “Research Facility” at the Heidelberg University Psychiatric Department (1943/44)”, in ibid., p. 35-42. [iv] A. Ley, ”Children as victims of medical experiments in concentration camps, in ibid., p. 43-52, here p. 51.